Supplied in 1763-4 to Edward Leigh, 5th Lord Leigh of Stoneleigh (d. 1786) for Stoneleigh Abbey, Warwickshire by William Gomm and by direct descent in the Leigh family at Stoneleigh until included Stoneleigh Abbey, Christie's house sale, 15 October 1981, lot 127 when purchased by the present owner. The coming of age of Edward Leigh, 5th Lord Leigh in 1763 heralded a large programme of modernisation at Stoneleigh Abbey, Warwickshire, the ancient Cistercian monastery that had been purchased by his ancestor, Sir Thomas Leigh in 1561. William Gomm (d. 1780), of Clerkenwell Close, London, was the principal cabinet-maker employed by Lord Leigh to furnish the new rooms, with most of the alterations taking place on the bedroom floor. Bromwich & Leigh of Ludgate Hill were employed as the decorators. Gomm's detailed bills, dating from 12 May 1763 to 6 October 1764 total £884 0s 6d. (reduced by returns to £818 9s 0d), and are among other surviving furniture bills in the Stoneleigh archives (now at the Shakespeare Birthplace Trust, Stratford-upon-Avon). Gomm supplied fourteen Pembroke tables over the two years, of which the present pair are probably two of the '4 28 Inch Pembroke Tables with Boards, for the Rooms No. 2. 3. 11 & 12 @ 45s -£9 - - ', dated 16th June 1764. 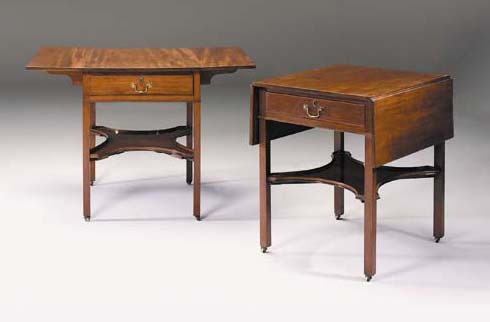 Like the majority of the case furniture, all in mahogany, they are extremely well made and plain, reminiscent of Chippendale's 'Paxton' style, and like most of the furniture, generally intended for bedroom use. The minor difference in the legs of the present lot (one table has chamfered legs) is not surprising, given that they were intended to go into separate rooms. Various chairs supplied by Gomm at the same time as these Pembroke tables were sold from Stoneleigh, Christie's house sale, 15 October 1981, lot 98, and in these Rooms, 19 November 1981, lots 106, 107, 108, 109, 110. Undoubtedly Gomm's tour de force of the whole commission, is the rococo altar table made for the Chapel at a cost of £31 10s, and offered by the Stoneleigh Abbey Preservation Trust, in these Rooms, 19 November 1981, lot 115 and exhibited at the Victoria and Albert Museum, London. A related Pembroke table bearing the label of Richard and William Gomm (Gomm's son Richard had joined the business as a partner by 1756), was sold by the Trustees of Lady Grant and of Sir Anthony M.L. Cope, Bt, Bramshill Park, Hampshire, Sotheby's London, 24 Februry 1967, lot 145. The label was inscribed in ink 'John Mordaunt Cope', the owner of Bramshill, presumably a client (C. Gilbert, Pictorial Dictionary of Marked London Furniture 1700-1840, Leeds, 1996, pp. 30 and 225, figs. 401-402).